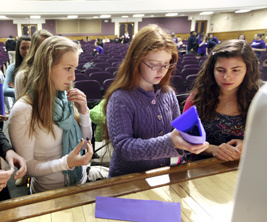 Check out the action at the 2010 Career Day for Girls. Catherine Hurley, the sustainable programs coordinator for the city of Evanston, will kick off the program with a keynote address from 9:15 to 9:45 a.m. in the Technological Institute’s Ryan Family Auditorium. Hurley will share her story about how she became interested in engineering. In the design competition (9:45-10:30 a.m.), teams of eight will use a fork, wire hanger and rubber bands to build a prototype of a newspaper delivery device that can ensure consistent delivery of a sponge into a hula hoop. Students participating in lab tours (10:30 a.m.-12:30 p.m.) will, among other things, learn about different prosthetics that change the lives of patients at the Rehabilitation Institute of Chicago, isolate fruit DNA from a banana, explore 3-D printing and view a spinning bicycle wheel that defies gravity. For the afternoon portion (1:15-3:30 p.m.) middle school students will rotate through three different hands-on activities where they will build bridges with marshmallows and spaghetti and learn the basics of computer programming. 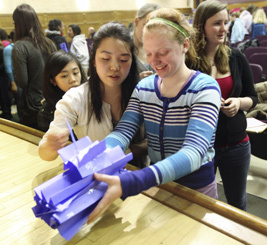 High school students will choose among four interactive panels about engineering. Panels will expose students to various aspects of materials science and civil and mechanical engineering. After the panels, they will build a Rube Goldberg machine (2:30-3:30 p.m.).